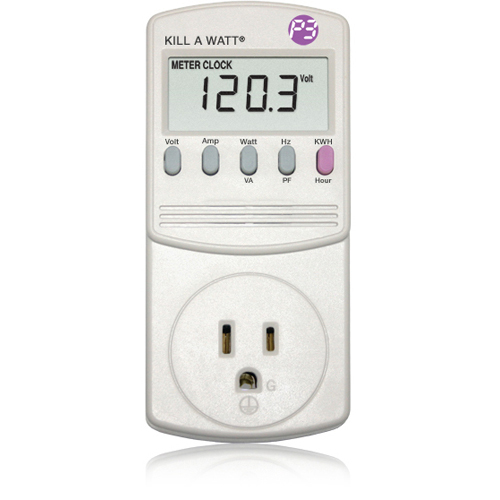 Get a handle on your energy consumption with a Kill-A-Watt monitor, which keeps an eye on exactly how much electricity devices and appliances draw from the plug. Use this information to determine how to make efficient use, or replace juice guzzling appliances. Click here to reserve one today! By knowing how much current is drawn by devices, appliances, and other electronics you can strategically plan your energy savings or put a real-world value on associated operating costs. You can also get an idea of how much energy is used by devices in standby vs off. The results might surprise you! By plugging the Kill-A-Watt Monitor into the wall and other electronics into it, you can get an accurate reading of how much current is used at any time, even when the device might otherwise appear to be off.